My transfer case (a NV/NP-271D) didn't come with a position switch, for some reason. The computer has had a code saying there's an issue with the transfer case since I got the truck, and the wire header to connect to the transfer case has just been dangling. Well, also, the transfer case has been leaking since I got the truck, and I finally got around to both ordering a position switch (Airtex 1S4129) and taking the case off the truck. After cleaning the case completely, I discovered that although there is a hole for the position switch, just as there should be, there seems to be a metal plug at the bottom of the hole. It seems as if the hole was never drilled completely through to the interior of the case, and the hole also is not threaded. 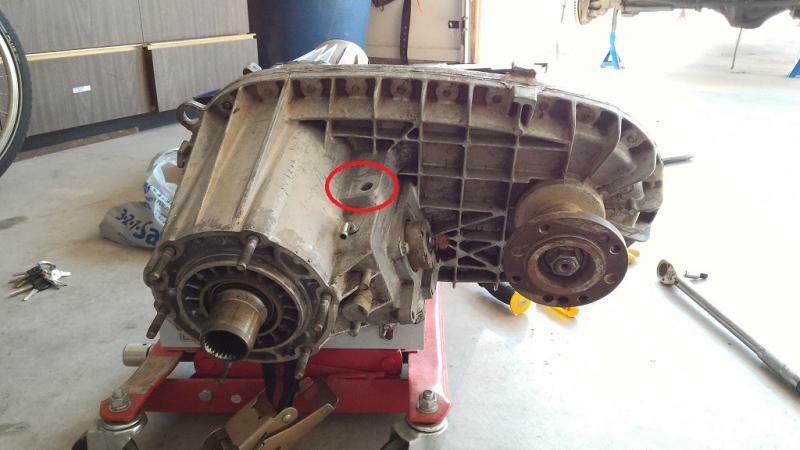 I'm wondering if anyone has encountered this with what is probably a reman transfer case, and how to fix it. I suppose I could completely dismantle, drill out and tap the hole, but before I do I figured I'd see if anyone has seen this before. Well, after three days and nearly 300 thread views, not a single reply. I guess no one else has ever seen this. I couldn't buy the correct size of tap locally, so I decided to skip it. Maybe I'll fix it in the future. 04.5 Silver 3500 Quad Cab, Long Bed, Dually, 4X4, NV 5600, Intake Horn, Bully Dog Triple Dog, High Idle, FASS 150/150And A MANIAC Behind The Wheel! Yup, it's actually a five-position sensor -- it's kind of neat. I wish I could use it. Anyone want to buy one?